Note: Don’t chop onion too fine, it should be bit big sizes. Add mustard, let it splutter. Add onion and 1/4 tsp salt, stir for 1 min. Saute till onion turns transparent. Note: don’t brown or burn onions it may change taste and will not be crispy. 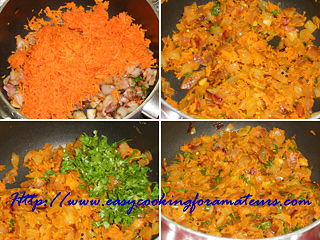 Add carrot, saut for 2 min. 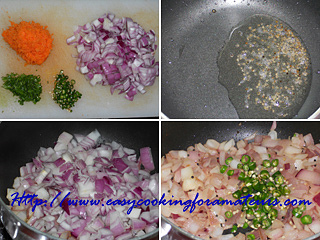 Add coriander/cilantro, mix well & turn of the heat. 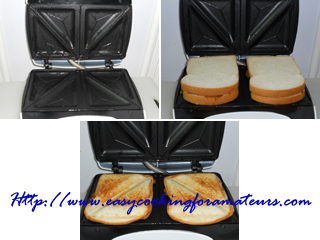 Toast can be prepared on griddle/tava or in sandwich maker. Put some butter and spread on it. Place bread slices and toast till it gets slight golden brown spots. Flip and do the same to the other side. Note: Don’t over toast the bread, it will get hard. You can also use ghee/clarified butter instead of butter. Spread the filling on top of the bread. Serve when it is warm. Repeat the same to all bread slices. Note: If the toast cools down before serving. Place the stuffed toast on hot griddle/tava. Warm it both sides and serve. Just flip and remove don’t toast. or you can use microwave. Place bread slices on plate or tray. Spread the filling on it. Spread butter on both sides of the sandwich maker. Place the stuffed bread and gently close the sandwich maker. Toast till it gets slight golden brown spots. Remove it to a serving plate. Repeat the same to all stuffed breads. If you want you can cut it into half & serve. 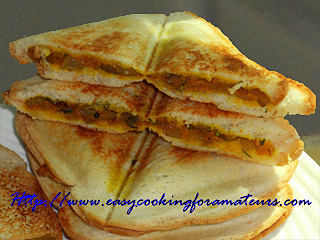 Spicy onion and carrot sandwich is ready to serve hot. awesome dear...i remember eating this in my childhood....love it! Please vote for them if you find them interesting. 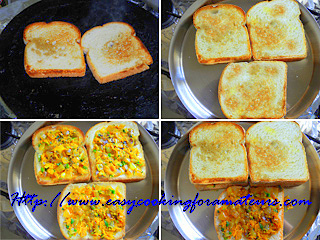 Never say no to this irresistible toast..
wonderful and yummy toast, great pics n explanations..bookmarked it..
very yummy sandwich,looks delicious n healthy.. Damn I'm hungry now, . Hey, thanks a bunch for the lovely comment and for the follow..this toast is bringing back nostalgic days of our life in coorg..there used to be an Iyengar bakery at the place we lived...thanks for sharing this....happy to follow u too. 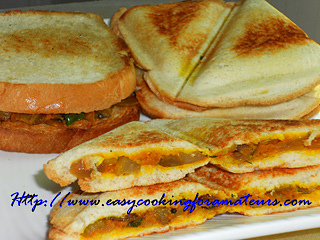 love this simple sandwich.. really handy to send to school with kids tiffin. thankyou for sharing..
very nice..will definitely try this one out!! Found you through Linkedin. I make toasties all the time but not used your combination. 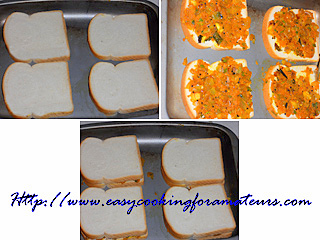 Bread toast and carrot sandwich is nice and awesome one. Thanks. Clickfoodsnearme. Hi Nice presentation. I tried this and it came out really good. to you, Congrates, please collect it from the below link. Do comment on my post and on your award post when you receive it. .
A very healthy treat for breakfast.